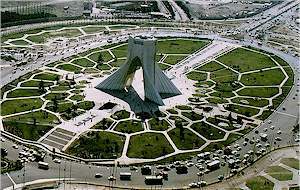 This tower which represents the city of Tehran is part of Azadi (Freedom) cultural complex which is located in Tehran's Azadi square in an area of some 5 Acres. This complex is composed of the following sections; The 50 meter high Azadi tower which forms the main part of the museum and its architecture is a combination of Islamic and Sassanid architecture style. The audio - video hall of the complex which has been designed based on Iran's geographical map displays the regional characteristics of Iran in so far as cultural, life style, religious and historical monuments are concerned. A mechanical conveyer allows the visitors to visit the hall in total comfort. Some art galleries and halls have been allocated to temporary fairs and exhibitions. The Diorama hall with 12 chambers puts to display activities in agriculture, handicrafts, modern industry, etc. A cinema, library and sideline services complement the activities of this complex. Tehran: Covering an area of 1500 sq. kms, Tehran is situated in the north-central part of Iran, on the slope of the Alborz Mountain. As the national capital it is the most populated city in Iran and the center of cultural, economical, political and social activities. It is about 1200 meters above sea level and enjoys a mild climate. Although the word Tehran can be found even in some books dating back to the 10th century, it was but a village containing numerous gardens in the distant past. Its importance began to increase in the Safavid period (1501-1736). Shah Tehmasp, the king of Iran from 1524 to 1576, was fascinated by the climate of Tehran, as a result of which many buildings including caravansaries were founded. He also built many towers around the city. In the reign of agha Mohammad Khan, the founder of the Qajar dynasty (1776-1925), when Tehran was chosen as the capital of Iran, it enjoyed a boom. The building founded by Naser od-Din, shah of Iran (1848-1896) gave it a high position among the other cities. A ditch was dug around the city to repel attacks on it, twelve gates were built as the approaches to the city, and a large square, now called Tupkhneh and the buildings around were founded. After the Qajar period, two architectural trends developed: an imitation of Western styles that had little relevance to Tehran's climate and an attempt to revive indigenous designs. The latter trend has been reinforced after the Islamic Revolution. The population of Tehran has had a boom in the last decades, as a result of which urban development has not been smooth. In the recent years the municipality of Tehran has taken great measures to increase the number of recreational facilities, including park, stadiums, theaters,etc.